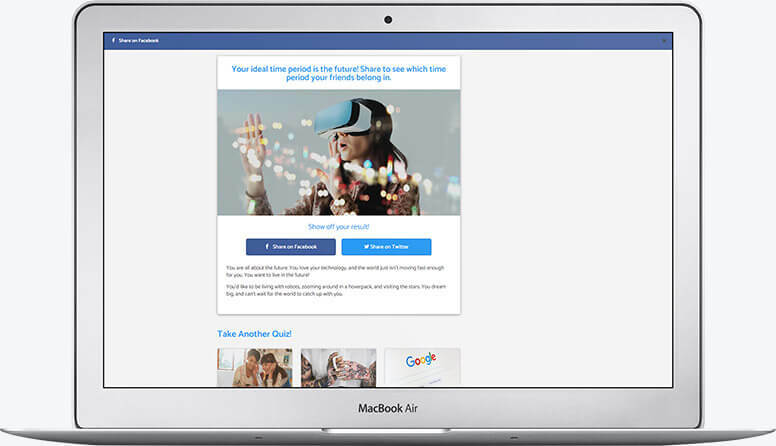 We were given two weeks to create a site that was as easy for the authors to create quizzes as it was for the users to take them, and we succeeded on all accounts. The site features an easy to use interface with several types of questions. One of the most-data driven layouts we've worked with. Building quickly is more about planning than typing faster. A qualified plan results in lower costs specifically due to forethought. We were given just two weeks to take the site from the “idea” to reality. 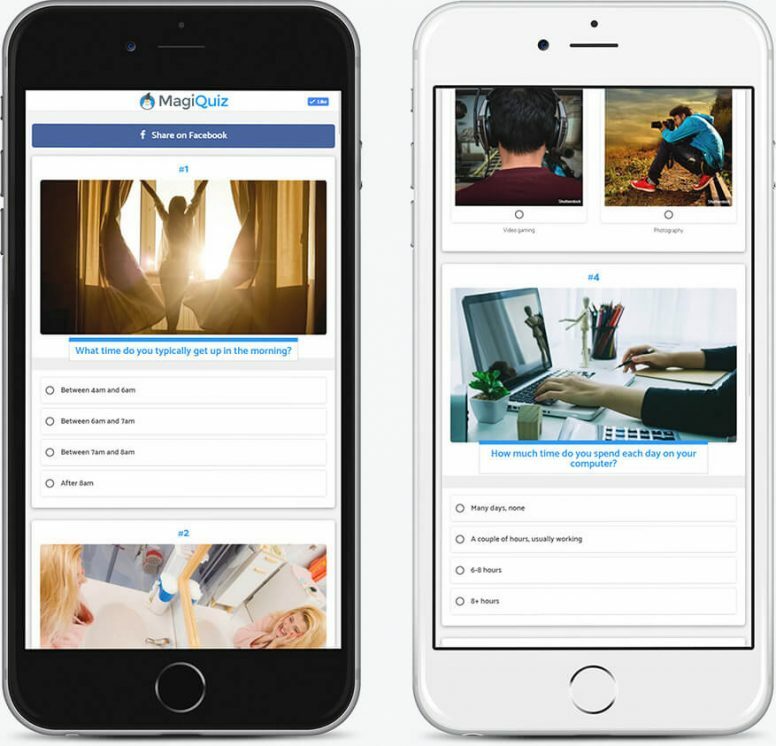 Fortunately for Magiquiz, we’ve gotten pretty used to the phrase “as soon as possible”, meaning that we’re comfortable working within hefty time constraints. We leveraged our knowledge of existing technologies to simplify code and the design. This allowed us to avoid duplicating work and we were able to get rolling as soon as possible. Drawing knowledge from previous projects, especially having worked with Brainjolt Media before, we were able to get the project moving quickly. And, being a small and nimble company, we cut through the red tape and focused our time on creating the site instead of unnecessary meetings. Creating new quizzes requires a complex system; the authors need to be able to quickly and easily add multiple types of questions that change the outcome of the quiz for the end user. There are a lot of moving pieces that have to come together to create a seamless user experience. While we’re not at liberty to disclose the exact system in place, we can say that we developed an intuitive system allowing authors to easily flip between questions, answers, and results to create quizzes with their desired outcomes. Nobody likes seeing ads, but they’re what keeps the content on the internet free. 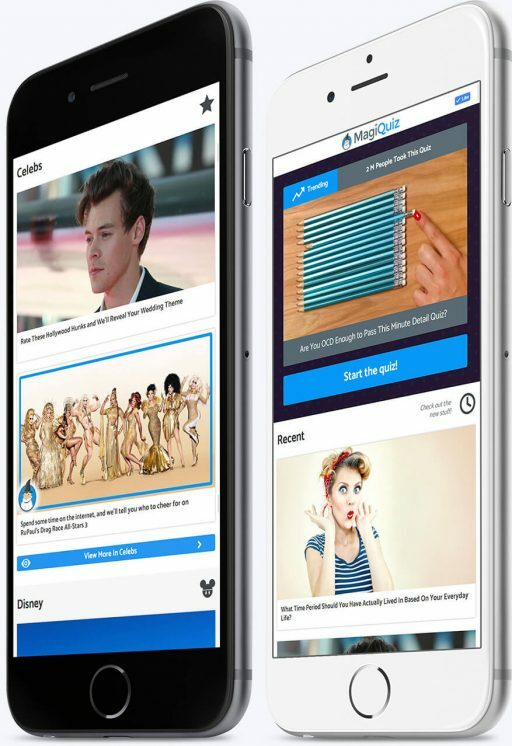 MagiQuiz is powered by advertising, keeping the content free for users. We were tasked with building a system to show users ads without intruding on the overall experience. We integrated the site with several of the best advertisers, making the site profitable while maintaining a seamless experience for the users. To this day, we continue to work with Brainjolt Media to upgrade their website based on user interaction and performance data. As we work, the site perpetually improves, increasing profit margins and making the experience better still for the end-user. On desktop, we focused more on building an engaging personality for the site while sticking to minimalist principles. 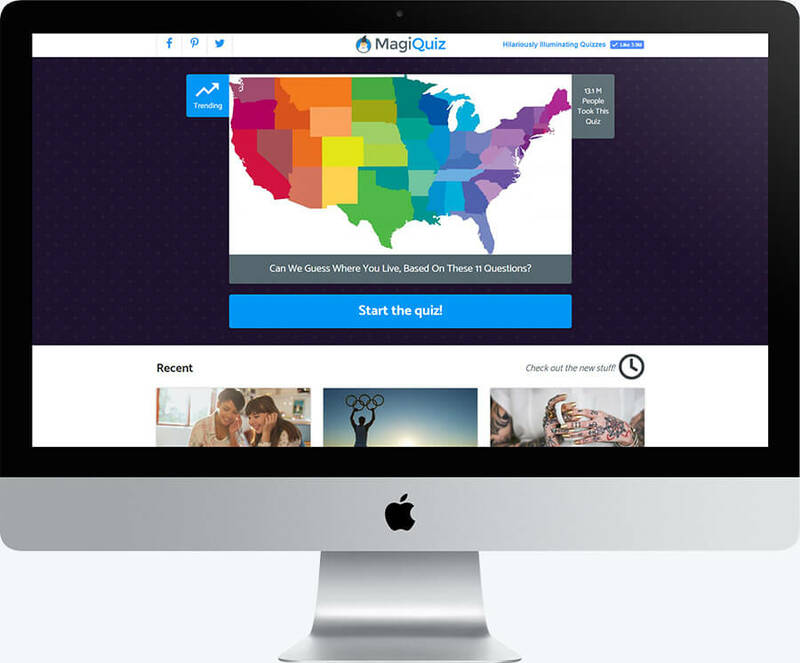 This is an example of a results page presented to a user after they successfully completed a quiz. Heavy focus is placed on social media. They have a high-conversion rate due to the amount of A/B testing that has gone into colors, wording, and placement. During our web design planning, we wanted to ensure that users were presented with a clean interface with large touch targets to answer the questions quickly and efficiently. We provided large click-targets for users.